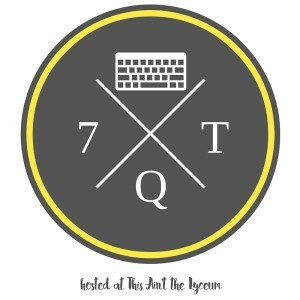 I'm joining Kelly at This Ain't the Lyceum this week for Seven Quick Takes. Our CCW (Council of Catholic Women) was asked to host the Diocesan Convention this year. We had a meeting on Monday, and 3 of our officers almost managed to get kicked out. Okay, that may be a bit of an exaggeration. We did, however, get "shushed" some. We're in our second (and last!) year of being officers. We do like to laugh and have a good time. Some were not amused. After last year's convention, we were holding our breath because we knew it was our Deanery's turn to host. We almost got out of there without hosting! After the meeting, a young lady saw my Blessed is She Planner (currently sold out) and asked if she could see it. We completely Catholic Geeked out talking about what we, as Catholic working women, want need in a planner. You've gotta love talking to other women who 'get' what you need! 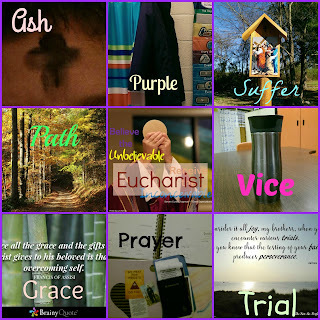 You can follow along with my photo journey through lent by following me on Instagram: @tnslp. To catch up and/or join in, click here for the information. This whole "keeping your thoughts about other people to yourself" thing is hard. REALLY hard. It's making me realize how many times I think negative thoughts about other people. I guess if it was easy, everyone would be doing it, right? I don't know Leticia, I've only listened to her on the Jennifer Fulwiler Show (The Sirius Catholic Channel). She's gone through some real struggles in her life (she is a self-proclaimed "hot mess"), and this just absolutely broke my heart. I looked back through her feed, and she seemed to be getting things together with classes. Just the day before she was asking people to pray for her dog, and yesterday she's asking for prayers for her son and her family. I know from experience how traumatic it is when you have a child dealing with depression, but this is beyond my comprehension, to lose a child due to suicide. Please pray for her, her family, and her son. May he now find the peace he was unable to find. As a School Speech Pathologist, I am responsible for 2 schools. 1 of them is not far from the gate to the Smoky Mountains National Park, so the scenery can be pretty, depending on when the sun rises. The past few mornings I've driven there, it seems like God has painted the sky just for me. August skies are usually pretty spectacular, but lately they've been just as pretty. I had to pull into the middle school parking lot on Tues. to take this picture. It was just gorgeous! The picture still didn't really do it justice, but I think you get the idea! Every now and then, when I read the daily readings, a song will pop into my head. And stay there. A true "ear worm". Tuesday's reading did just that. "Lord, teach us to pray." And I've had the following song stuck in my head ever since. We had this album when I was young. There are some really good songs in that album; this one in particular comes back to visit often. I missed out on the blessed is she planner! It was sold out by the time I tried! NEXT YEAR! !